You have interesting things to say and it doesn’t seem that hard, why not start using a Pod of Casting? Eating one of the fast-growing seeds from the pod allows you to make your voice appear in the minds of every creature within a thousand feet for one hour…well, most of an hour. About halfway through there’s usually a minute-long advertisement for indigo aprons and inexpensive razors shipped from another plane of existence. After using the Pod of Casting, you must wait a week before using it again. After all, you don’t want to flood the market, it’s definitely not because this is a much larger time commitment than you first thought. 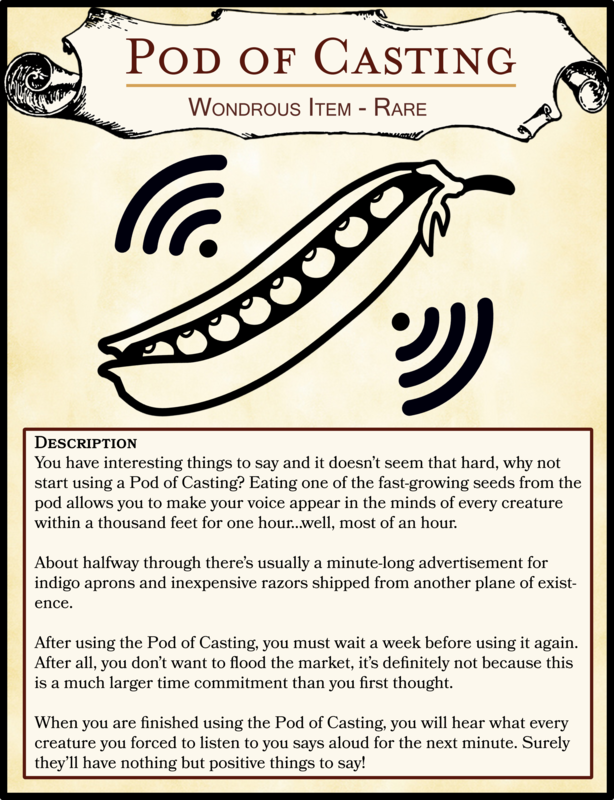 When you are finished using the Pod of Casting, you will hear what every creature you forced to listen to you says aloud for the next minute. Surely they’ll have nothing but positive things to say!